*MSRP does not include tax, title and registration fees. WRX/WRX STI excluded from VIP Programs. All other models are subject to availability and dealer discretion. Limited time offer subject to change without notice. Terms and conditions apply. Prior sales excluded. This offer replaces all existing offers. Valid in the U.S. only, except Hawaii. Cannot be combined with any other SOA promotional offers, coupons (such as auto show or internet coupons) or direct mail offers (except SubaruGuaranteed Trade-in Program (GTP), $500 Subaru Added Security® Maintenance Plan Coupon or Subaru Reward Dollars). For further assistance from Subaru regarding the VIP Program, please contact VIP Program Headquarters at 1-800-VIP-0933 or via email at vipprogram@subaru.com. 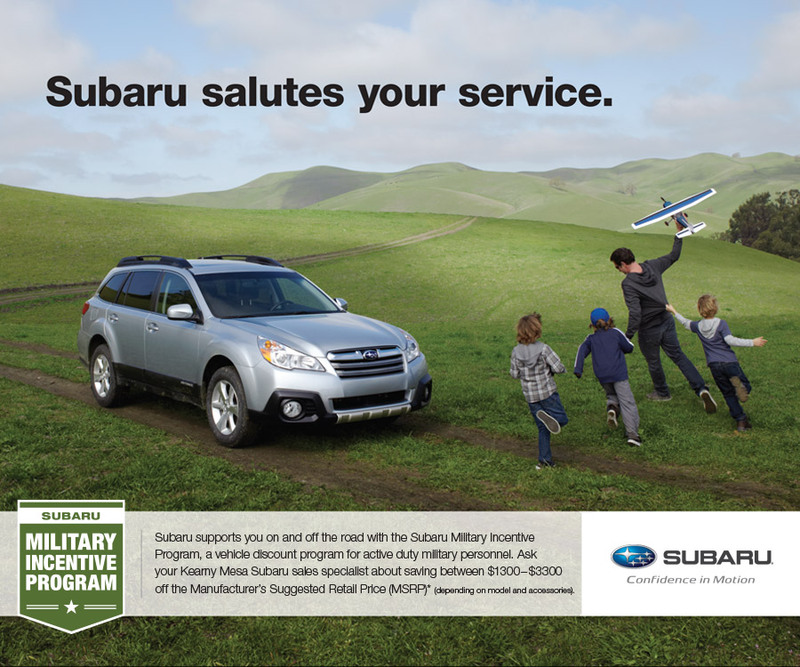 The men and women of the United States Military epitomize bravery and selfless service and, at Kearny Mesa Subaru, we're proud to participate in the Subaru Military Incentive Program. It's a small way we can say "thank you for your service" by helping you save money when you purchase a new Subaru. Eligible active-duty and reserve personnel in the United States Armed Forces qualify for special incentives that can equal as much as $3,300 off MSRP on a new Subaru. You serve us with pride and we'd like to return the favor. Any of our friendly sales professionals can help you determine which new Subaru will be perfect for your lifestyle and guide you through the incentives available. If you're an active-duty or reserve member of the U.S. Army, Navy, Marines, Air Force or Coast Guard, bring in your military I.D. and it will be our pleasure to show you just how much you can save. We can also provide you with excellent service after the sale. For almost a decade, Kearny Mesa Subaru been the premiere, full-service Subaru dealer in the San Diego area, featuring an excellent selection of quality pre-owned vehicles, an incredible variety of Genuine Subaru Parts and Accessories, a state-of-the-art service, maintenance and repair facility staffed by factory certified technicians and, of course, a great inventory of new 2014 Subaru vehicles from which to choose. Backed by Sunroad Automotive's 35+ year tradition of customer service, it's no wonder than Kearny Mesa Subaru has been named a 2013 Subaru Stellar Care Award Recipient, an honor only given to the elite of Subaru dealers who stand out in every aspect of customer care. When you're ready to speak with one of our knowledgeable sales professionals and take advantage of the Subaru Military Incentive Program, feel free to utilize our convenient online inquiry form, call us at (877) 440-7603 or visit our dealership. We're conveniently located at 4797 Convoy St, San Diego, CA 92111, a short drive from Carlsbad or Escondido, California and mere minutes away from anywhere in San diego. We look forward to serving you with pride at Kearny Mesa Subaru!